Ronnie Haysley, left, and his son Dale strive to give their customers the best possible finished product in hardwood flooring. Both son and father continued working for the Louisville company when Ronnie’s family moved to LaRue County in 1989, where he added side jobs on his own before deciding to start his own business inside their home. She said the most common flooring people want is either red or white oak, but others call for ash, maple, pine, and cherry. “We’ve done other more uncommon kinds of wood, too, including Brazilian cherry and Purpleheart,” she added. The company has completed projects locally and in homes in Indiana, Louisville, Bowling Green, Lexington and other cities in addition to churches and businesses. For more information call 270-358-3044. 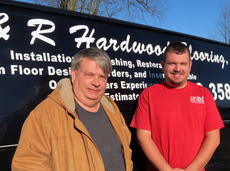 They are also on facebook at www.facebook.com/RRHardwoodFlooringInc.